The GT was a performance and trim upgrade to the base Mustang. It was offered in both the coupe and convertible body styles. The engine was upgraded to a 4.6L SOHC V8. Hood scoops and a rear decklid are standard equipment on a GT. Fog lights are installed under the front bumper in the corners. Tropic Green 2003 Mustang GT convertible owned by Rizzo from Palm Beach, Florida. He says he won it in a craps game! It was our featured Attitude Of The Week photo for the week of 5-11-08. This Tropic Green 2003 Mustang GT in front of the Mustang Club is owned by James Brown of Texas. It was our Attitude Of The Week for January 18th, 2009. James says that he purchased this car three years ago with 15,900 miles on it. Yellow 2003 Mustang GT coupe owned by Steven Hudson from Virginia Beach, Virginia. This is our featured Attitude Of The Week for August, 16, 2009. This one has a 4.6L V8 engine rated at 260 horsepower. Steven has added black accents to the exterior - like the dual over-the-top racing stripes, rocker stripes, black hood and side scoops, and a black spoiler. 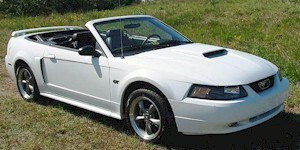 Oxford White 2003 Mustang GT convertible with factory 17 inch wheels and a rear decklid spoiler. Sonic Blue 2003 Mustang GT coupe owned by Dwight Koslowski from Westland, Michigan. This was our featured Attitude Of The Week for the week starting February, 7, 2010. Modifications include K&N cold air box, BBK 78mm throttle body, SCT chip, and Bassani X-Pipe with Flowmasters. Striped by Dr. Ru. These photos taken outside the vintage filling station on the grounds of the Gilmore Classic Car Museum in Hickory Corners, Michigan. Here is Karen Baum making a pass in her Ebony Black 2003 Mustang GT on the Speed Channel show called Pass Time. This was our featured Attitude Of The Week for the week starting February 21, 2010. Karen tells us more, "I bought this car two years old and found out later she was a repo from Jersey. She was a little rough and only thing done to her was the exhaust (which I ended up fixing since it was poorly done). After doing the exhaust, I was told this car was too masculine for a girl to drive. That is when 'Nasty' would come to be. I think she is too much for a man to drive now;-). Nasty 03 is featured in the AmericanMuscle.com calendar for January 2010. Also appeared on the TV show 'Pass Time' which airs on Speed Channel. These are the modifications (which is hard to keep current!!). Currently over 40 between appearance and performance. Performance modifications include: custom 3-inch tipped catback, BBK ceramic longtube headers and off-road H-pipe, FRPP 3.73 gears, FRPP C-springs, Accufab 70mm throttlebody and plenum, MGW short shifter, clutch adjuster, Steeda underdrive pulleys, Steeda cold air intake, SLP Line-lock, driveshaft loops, subframe connectors, Brembo slotted rotors, 245/45-17 NITTO 555Rs in front, 325/45-17 M+H Racemasters in the back, and SCT XCal SF3 Tuner with custom tuning by SWARR Auto. Gotta look good too: 20% window tint, Xenon quarter window louvers, ABS rear window louver, black Shelby Torq Thrust M rims (17x8 in front, 17x10.5 deep dish in back), Smoked headlights and foglights, 8-inch black antenna, chrome billet scoop inserts, Mach 1 grille delete, painted Mach 1 chin spoiler, UAD skeleton grille pony emblem, UAD airbrushed flamed radiator cover, MGW underhood dress up, chrome strut and nut cap covers, UPR 2-tone interior knobs and coat hooks, FRPP Bullitt pedals, MRT billiard shift knob, red LED interior lighting, redline tuning hood struts, GT embroidered floor mats, polished shifter bezel, Saleen S281 wing, Web Electrics sequentials, and Kenwood DDX512 6.1-inch wide in-dash monitor with USB/iPod direct control/DVD receiver stereo." Silver Metallic 2003 Mustang GT convertible with the top down. It has a black interior, black top and a decklid spoiler. Tom Longerbeam owns this Zinc Yellow 2003 Mustang Mach-1 made from a GT. Tom tells us, "I bought her used with 17k miles. I have never been able to leave well enough alone, so my 2003 Zinc Yellow Mustang GT Convertible is now a 2003 Zinc Yellow Mustang GT Convertible MACH 1. She has over four pages of well placed modification done, including a Zex wet kit nitrous setup along with other mods to the powertrain. She is pushing over 400 hp!" Custom Pink 2003 Mustang GT coupe with a custom front end and a 260hp (at 5250rpm), 4.6 liter, single overhead cam, V8 engine. This is an unusual Mineral Gray 2003 Mustang GT coupe. Can you tell what's different about this one? Compare with this Mineral Gray 2003 Cobra from the same view. The top has been copped. It was chopped at total of 2.5 inches. Dark Shadow Gray 2003 Mustang GT with Roush upgrade owned by Joe Pugliese from Kingston, New York. It has the 4.6L SOHC engine and manual transmission. Joe adds, "I purchased car two months ago. The Roush upgrade was done by the guy I bought from - exhaust, skirts, Cobra hood, suspension, and rims. The car looks great and sound even better." Tropic Green 2003 Steeda Mustang GT coupe with a Vortech V-2 SQ Supercharger sitting on top the stock 4.6L engine. It's a factory Steeda - serial number #2003-007 out of 206 built in 2003. The exterior Steeda upgrades include a Cobra R cowel induction hood, the Mach-1 grille delete, functional rear decklid spoiler, Sidewinder graphics, and 18x9 inch wheels. Sonic Blue 2003 Mustang GT coupe owned by Eric Biggs from Georgia. It has a 4.6L V8 engine, an automatic transmission, off road Summit Racing H-pipe, and SLP LM1 Catback exhaust. Eric has nickname this Mustang, 'Blue Thunder'. Tropic Green 2003 Mustang GT convertible with a tan interior and top. It has the 4.6 liter V8 engine under the hood. Torch Red 2003 Mustang GT coupe owned by Chris from Inverness, Florida. It has a 4.6L V8 and an automatic transmission. Chris use to have a 2002 Mustang with a V6 and a 5-speed. He says he loves the V8 in this one. Black 2003 Steeda Mustang GT coupe with Steeda designed hood, unique front air dam, and functional rear wing; Steeda 18 x 9.5 inch chrome five spoke wheels; Steeda handling with sport springs and front and rear stay bars, Steeda aluminum rear lower control arms, adjustable panhard bar, fully adjustable rear upper control arm, Steeda bump steer kit Steeda strut tower brace and camber adjusters, and Steeda control arm relocation kit; and a 4.6 liter, 3 valve, V8 engine with 5-speed manual transmission, Steeda billet aluminum tri-ax shifter, Steeda cold air induction kit, and Steeda high flow exhaust system. Zinc Yellow 2003 Mustang GT coupe owned by Ritchie Hayden from Atlanta, Georgia. It has the 4.6L V8 engine and an automatic transmission. Ritchie tells us more, "I bought the car about 2 months ago after a long search looking at many cars for sale. Most of them were overpriced for the condition they were in. This one was a great price, awesome condition, and low miles! Mods I have done so far include: Spectre Racing air filter, C&L 82mm CAI, BBK Performance 75mm throttle body, C&L upper intake plenum, Performance Automatics shift kit, SR Performance drilled and slotted brake rotors w/ceramic-carbon pads, American Muscle chrome Bullitt 17x9" and 17x10.5" wheels, Nitto NT555 17x35x275 and 17x40x315 tires, and Flowmaster 2-1/2" catback dual exhaust w/series 40 mufflers and 3" tips." Black 2003 Mustang GT coupe owned by Donald 'FUZES' Woods from West Virginia. This is our featured Attitude Of The Week for the week starting January 29 2017. It has the 4.6L V8 and an automatic transmission. Donald tells us, "Purchased in 2007 from dealer stock. 40,000 Original miles. Started modification's in 200. First I start with the wheels, and then the Kaminari body kit, and Cobra R rear spoiler, side scoops, and finally the Black Single Stage Paint. First year at local car shows, I won two trophies from three shows. Second year I showed at 10 shows and won 7 trophies. The most interesting was the Best Tuner." Dark Shadow Gray 2003 Mustang GT coupe with Bullitt wheels, Bullitt grille, Mach 1 front spoiler, Flowmaster exhaust, and Mach 1 shaker hood. This customized GT was at the 2010 Mustang Roundup in Tampa, Florida.